Norway is the most forward-looking country in Europe when it comes to electric vehicle adoption — Tesla Model 3 registrations are breaking all records after shipments to the country started last month. In the last few months, we have seen European Model 3 deliveries on the rise, the first-ever vehicle transport vessel containing Model 3s reached the Port of Zeebrugge, Belgium in the first week of February and the rest is history. Tesla Model 3 registrations in the last few weeks have been an all-time high for Tesla vehicles itself as we can see in the graph below (source: TeslaStats.no) — since Norway’s vehicle registration data is available on the same day, tracking the progress of a vehicle’s sales performance can be measured almost instantly. 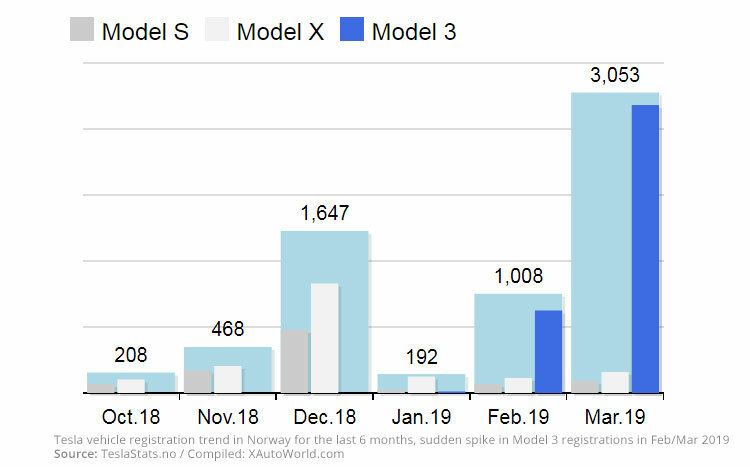 19th March was the peak day for Tesla Model 3 registrations with 366 units and a total of 399 vehicles registered including Model S and X, that’s in a single day — since then the registrations have been steady between 250 and 300 units per day. At the time of this writing, the total number of Tesla vehicles registered in Norway have reached 217 units and it is still around 6 hours when the date changes. The latest screenshot from TeslaStats.no shows the all-time highest Tesla vehicle registration numbers, Tesla has truly risen up in the country since the launch of Model X in 2017. All-time highest Tesla vehicle registrations in Norway till 21 Mar, 2019. Bjørn Nyland, a famous EV evangelist and Tesla community influencer from Norway also shared a video (below) of the Glovis Courage vehicle transport vehicle docked at the Port of Oslo and unloading which looked like around 1k+ Tesla Model 3s plus a few hundred Model S and Model Xs. The way things are progressing for Tesla in China and Europe, Elon Musk’s target of 400,000+ deliveries in 2019 does not look over-promising or unrealistic, as he said at the Model Y unveil event “11 years ago Tesla had only one car, today we have delivered over 550k+ electric vehicles” — however, Elon Musk is facing the wrath of SEC over his production and delivery goal tweets right now. Tesla Model 3 has truly invaded Europe and the disruption is visible more than ever now, progress from here should be in ludicrous mode from now on.